You probably already know that too much salt is bad for your health but many people aren’t aware that sugar can be just as detrimental. Eating too much sugar can help you to pile on the pounds. But even if you’re not looking to lose weight anytime soon, there are some good reasons to look at how much sugar you eat and how you can cut back on your consumption. Most of us eat too much sugar. Below are a handful of ways for how to eat less sugar. Diets that are high in sugar have been linked with diabetes, heart disease and even some cancers. 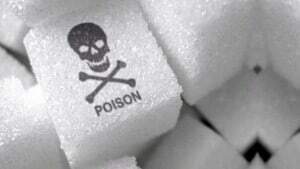 It’s not necessarily the sugar itself that is dangerous but how much we eat. For example, sugar can encourage weight gain, which can put you at greater risk of developing type 2 diabetes, heart disease and other conditions. On top of that, sugar contains empty calories and doesn’t have any nutritional value so if you’re eating sugar-rich foods instead of healthier alternatives, chances are that your diet isn’t particularly balanced either. To compound the issue, many sugary snacks and desserts also contain unhealthy saturated and trans fats. Experts suggest that sugar can be addictive. As with caffeine, it’s advisable to cut back slowly but surely rather than suddenly ditching sugar from your diet overnight. Start by cutting back on sugar in your tea or coffee or on your cereal until you don’t notice the difference and then aim to gradually cut back in other areas. Because your body has got used to lots of sugar in your diet, you may get some side effects from cutting back but these should pass relatively quickly. Sugary drinks like cola are a big culprit but fruit juice can also contain a lot of sugar unless you choose those with no added sugar. If you can’t do without fizzy drinks, diluting fruit juice with sparkling water can provide a healthier alternative. Snacks like cakes, biscuits and sweets are also prominent offenders but you can swap these for things like fresh fruit. Be careful with dried fruit though as this can contain more sugar than it’s fresh version. If you eat tinned or canned fruit, make sure that they are in fruit juice rather than fruit syrup. Natural sugars such as those found in fresh fruit don’t need to be eradicated from your diet – it’s added sugar that is of most concern. For example, milk contains lactose and fructose naturally occurs in fruit and vegetables. Look out for the added sugars outlined in the next paragraph as these are the real bad guys. Sugar is contained in a lot of foods and not just the obvious ones. Check the labels and you might be surprised to see that sugar is not only in the list of ingredients but it’s much higher up in the list than you’d imagine. The higher up an ingredient is in the list, the more there is in the product so you’ll want to avoid anything that indicates there will be a lot of sugar involved. Checking labels isn’t as easy as you might think as sugar isn’t the only word to look out for – ingredients like glucose, sucrose, fructose, dextrose, maltose, corn syrup, high fructose corn syrup, honey, hydrolyzed starch, invert sugar and maple syrup also indicate sugar. Protein isn’t broken down as quickly as sugar so your body shouldn’t release as much insulin in comparison. Good sources of protein include salmon, tuna, cod, halibut, shrimp, lobster, crab, chicken breast, turkey, dairy products, almonds, sunflower seeds, spinach and sweet potato. As with protein above, fiber makes you feel fuller longer. This means the more fiber you eat, the less hungry you will be. Fruits and veggies are great sources of fiber. An adult male for example, should try to consume close to 40 grams of fiber a day. Chances are you are no where near this amount. Skipping meals affects your blood sugar levels, which can have a knock-on effect on sugar cravings. Experts have suggested that we crave sugary foods to boost serotonin levels in the brain, which boosts your mood. You can get a similar buzz by doing some physical activity. Exercise encourages the release of mood-boosting endorphins – known as “feel good hormones”, which can help you to get a more natural ‘high’ without the downsides of a sugar rush. You don’t need to give up sugar completely but experts have suggested that most of us consume far more sugar than is actually healthy so for many people, cutting back is recommended for health purposes. This may seem like a daunting prospect if you’ve got a sweet tooth but it can be done as long as you’re willing to break the addiction. Readers, how do you eat less sugar? I have tried stevia in baked goods and my coffee and there is a taste I can not pin point that I just do not like 🙁 so sad I know but true. One of the worst things about processed white sugar though is that 1 tsp. blocks our immune system from working properly combine that with weight gain and it is defiantly worth the pursuit of cutting back if not cutting out completely! I really enjoyed this article PRT! I am glad. I try to write things that are useful. If you don’t like Stevia, try a touch of maple syrup. It is really good for you but you only need a pinch.